Table A1. Whole rock chemical compositions and, Sr and Nd isotope ratios of the olivine norite. 論説：U–Pb zircon dating of the Sanbagawa metamorphic rocks in the Besshi–Asemi-gawa region, central Shikoku, Japan, and tectonostratigraphic consequences. Table A1. LA-ICP-MS U–Pb concordia data from zircon analyses. Table A1. Representative chemical compositions of garnet. FeOT: total Fe. Alm=100*Fe/(Fe+Mn+Mg+Ca), Sps=100*Mn/(Fe+Mn+Mg+Ca), Pyr=100*Mg/(Fe+Mn+Mg+Ca), Grs=100*Ca/(Fe+Mn+Mg+Ca). Table A2. Representative chemical compositions of plagioclase. FeOT: total Fe. An=100*Ca/(Ca+Na+K), Ab=100*Na/(Ca+Na+K), Or=100*K/(Ca+Na+K). Positions from A to A’ correspond to the analytical points shown in Fig. 7. Table A3. Representative chemical composition of biotite. FeOT: total Fe. Mg# = 100*Mg/(Fe+Mg). Table A4. Representative chemical composition of hornblende. FeOT: total Fe. Mg# = 100*Mg/(Fe+Mg). 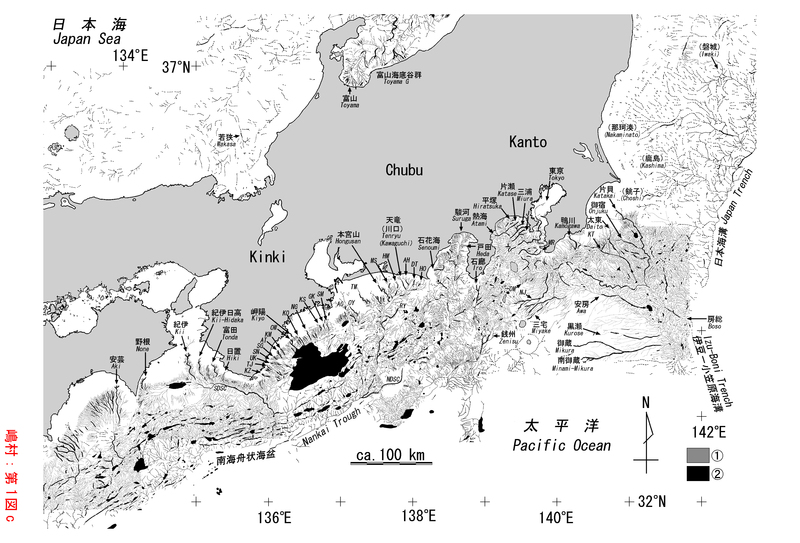 Open File(PDF): Sampling locality maps based on the 1:25,000 topographic maps “Onjuku” (a–d), “Kazusa-Ohara” (e), and “Katsuura” (f and g) of the Geographical Survey Institute, Japan. ppendix A (pdf). Articles compiled in the DODAI until the end of 2017. 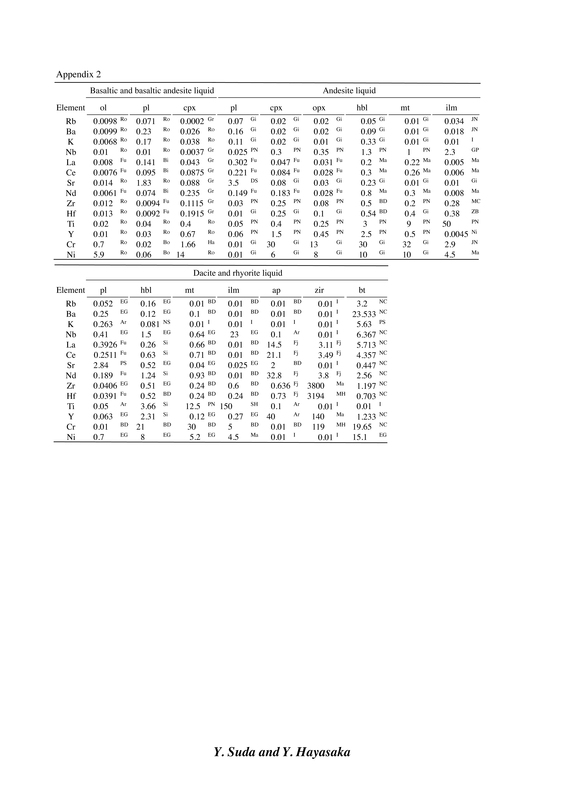 Appendix Table 1 (pdf). Characteristics of worldwide databases, some domestic databases, and the DODAI. (The numbers of references and samples were compiled from EarthChem until the end of 2017). Appendix Table 2 (csv). Compiling geochemical data of DODAI. Fig. A1. 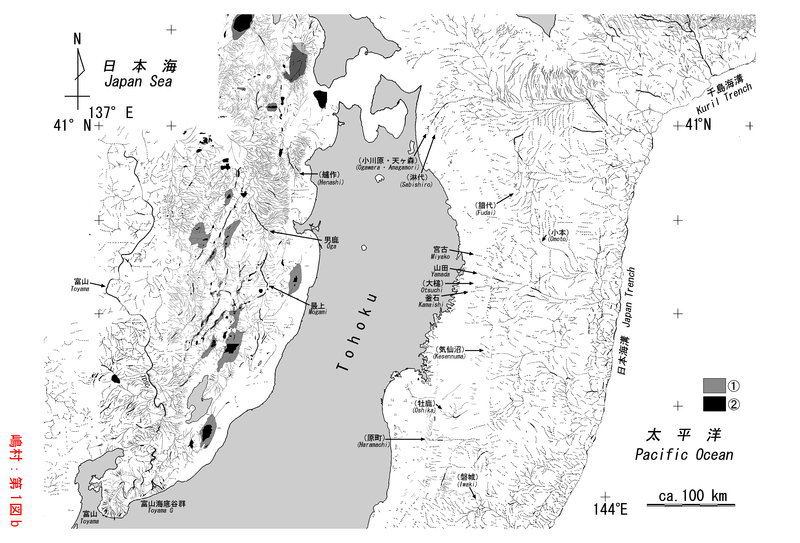 Geologic and location maps of the study sections along the Kiso River, central Japan. Modified after Wakita (1988). Fig. A2. Field occurrence of Late Triassic bedded chert at Sakahogi in the Inuyama area in the Mino Belt, Japan. (a) lower Upper Norian (lower Sevatian; Epigondolella bidentata conodont zone) bedded chert. (b) upper Upper Norian (upper Sevatian; Misikella hernsteini conodont zone) bedded chert. Scale bars, 5 cm. Table A1. Major element data for samples from the Sakahogi section. Major element compositions of the Sakahogi chert and claystone samples normalized to 100 wt%. Table A2. Analytical results of major element in reference material (JCh-1) by XRF. Appendix 1. Map showing sample localities. Base map is a topographic map downloaded from the Geospatial Information Authority of Japan (GSI; http://www.gsi.go.jp). Appendix Table 1. Bulk rock composition of samples estimated using XRF for DSDP Leg 58 Sites 442–444 and ODP Leg 131 Site 808. Appendix Table 2. Bulk rock composition of samples estimated using ICP-MS for DSDP Leg 58 Sites 442–444 and ODP Leg 131 Site 808. Appendix. Major-element contents of volcanic glass shards obtained by EDS measurement. Table A1. Summary of zircon U-Pb data by LA–ICP–MS. Table A2. Summary of zircon FT data. Fig. S1. Chronostratigraphic correlations, including inferred paleostress regimes and tectonic events, for the Hokuriku district and the Toyama Trough. The geomagnetic timescale is after ATNTS2012 (Gradstein et al., 2012). Diatom biostratigraphy is after Yanagisawa and Akiba (1998). The Intra Lower Teradomari Unconformity Horizon (ILTU) is after Muramoto et al. (2007). Fig. S2. 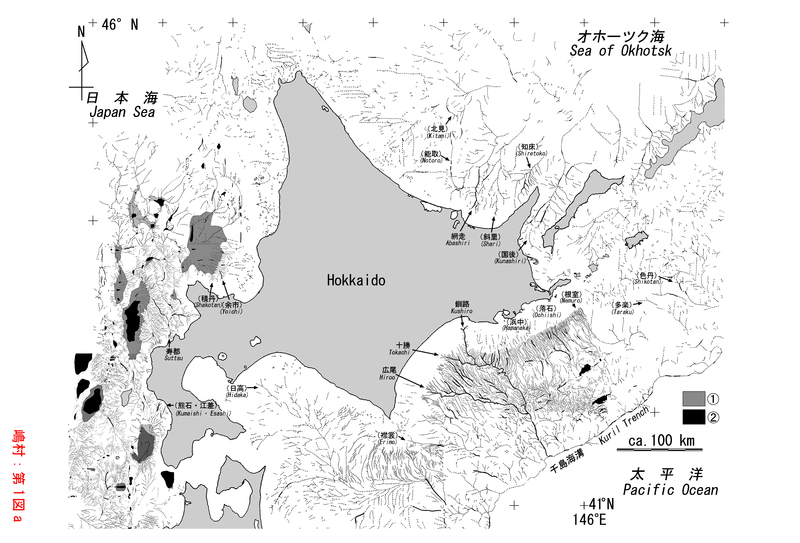 Tectonostratigraphic and paleoenvironmental relationships in the Sea of Japan from the middle Miocene to the early Pliocene (compiled from: Hanagata et al., 2001; Japanese Association for Petroleum Technology, 2014; Nakajima, 2013; and Sato et al., 1991). The planktonic foraminifera zonation is from Blow (1969) and Maiya (1978), the benthic foraminifera zonation from Maiya (1978), and the nannofossil zonation from Martini (1971) and Sato et al. (1991). Abbreviations: F.O., First occurrence; L.O., Last occurrence; PFSS, Planktonic Foraminiferal Sharp Surface (after Maiya and Inoue, 1981). Appendix 1-5. LA-ICP-MS U–Pb isotopic data. Analyses shown in italics are discordant data. Appendix 1. Glass composition data for Aira-Tn tephra and ATHO-G of MPI-DING Reference Glasses. Av., average; SD, standard deviation; U, uncertainty at the 95% confidence level; n, number of analyses. Preferred values are from Jochum et al. . Appendix 2. XRD peak intensities (cps and relative ratio) for analyzed samples. Sm: smectite (peak position is 2θ = 5.4°), Pyr: pyrophyllite (2θ= 9.3°), Kln: kaoline minerals (2θ = 12.3°), Crs: cristobalite (2θ = 21.7°), Qtz: quartz (2θ = 26.6°), Na-Alu: natroalunite (2θ = 30.1°). Peak position and intensity were analyzed using Peak Search for indows (ver. 6.1, Rigaku Corporation). Appendix 3. Log(thickness) versus square root of isopach area for magmatic tephra and pyroclastic surge deposits, with best-fit lines through the data used to calculate the eruption volume. Isopach maps for Iw-W6 c and d, Iw-W6 a and b, Iw-W5, Iw-OdS, Iw-W2b-2, Iw-W2b-1, and Iw-OkS are shown in Fig. 9, and isopachs for Iw-W9, Iw-W8a, Iw-SuS, Iw-SuSr, Iw-KSr, and Iw-KS are from Doi (2000). Appendix 4. List of coefficient of the equation, obtained from linear fits to data using the thickness-dispersion area coordinates in Appendix 3. Eruption volumes for each tephra are calculated after Fierstein and Nathenson (1992). Pyroclastic surge deposits Iw-KSr and Iw-SuSr are plotted alongside (straight lines). A specific gravity of 1.0 is used for scoria fall deposits, 1.5 for fine ash and volcanic sand deposits, and 1.2 for ash and scoria. Eruption ages for each deposit are summarized in Table 4. Open File. 1(mp4 18.4MB） Video taken at the gas-venting crater of Murono mud volcano at ~03:00 PM, 22 November 2014 (~7 hours prior to the 2014 Kamishiro Fault Earthquake). This gasventing crater is also shown in Fig. 1D. This video was taken from the same locality as Open File 2. Open File 2(mp4, 24.8MB) Video taken at the gas-venting crater of Murono mud volcano at ~09:00 AM, 23 November 2014 (~11 hours following the earthquake). Appendix 1. Example of measurement conditions. Appendix 2. Original data from the element distribution image as measured with an X-ray microscope (XGT-5000). Appendix 3. Comparison with measured values obtained using the point-counting method. Fig. A1. Photographs of the Saruodaki Falls. (a) Upper and lower parts of the falls. The rectangle indicates the location of the image in (b). (b) Horizontal sub-layers of the intrusive body, which are recognized by their fracture patterns. Fig. A2. 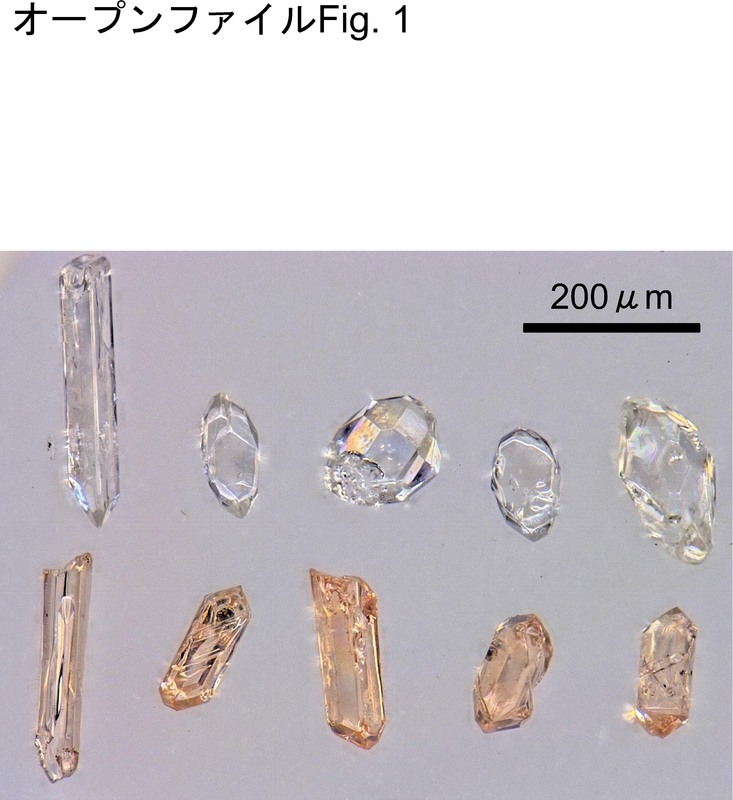 Photomicrographs of mounted zircon grains from the Tsukuriyama Laccolith (top) and the 20 zircons analyzed for U–Pb dating (bottom). Table A1. LA-ICP-MS FT age data of zircons from the Tsukuriyama Laccolith sample. Table A2. LA-ICP-MS U–Pb age data of zircons from the Tsukuriyama Laccolith and a secondary standard (OD-3). Table A3. LA-ICP-MS FT age data of zircons from the Tsukuriyama Laccolith sample. Appendix. Route maps of the radiolarian fossil locations. (A) Location R1, Isobedani River, (B) Location R2, Tsuiji River, (C) Location R3, west of the Kamiji Dam, (D) Location R4, Gochi–Erihara forest road, (E) Locations R5 and R6, Gochi River. C: coherent facies, GATL: Gokasho–Arashima Tectonic Line, R.: river. LA–ICP–MS U–Pb isotopic data. Rejected data are shown in gray color, not used in the analyses of the probability density plot and histogram. 206Pbc: common 206Pb. Fig. S1. Distribution of the Napier Complex in the Enderby Land and geological map of the Tonagh Island (modified after Osanai et al., 1999a). Fig. S2. Distribution of the Highland Complex in Sri Lanka (modified after Osanai et al., 2016a). Fig. S3. Distribution of the metamorphic complexes in the Kontum Massif (modified after Osanai et al., 2008). Fig. S4. Geological map of the Higo metamorphic Belt (modified after Osanai et al., 2016a). Table S1. Publication list for article on UHT rocks written by Japanese research group. U–Pb isotope data for zircons analyzed in this study. All errors are 2s. %conc = 100･(238U–206Pb age)/(235U–207Pb age) is a measure of concordance between 238U–206Pb and 235U–207Pb ages. Shading indicates discordant data that are not included in the probability density plots or histograms. Appendix Table 1 Analytical results of reference materials. Appendix 1. Radiocarbon ages obtained for dateable materials from the event deposits. Appendix 1〜5. LA-ICP-MS U–Pb isotopic data. Analyses shown in italics are discordant data（probability ≦ 0.1）, and are not included in the probability density pot and histogram. All errors are quoted at 2σ. 206Pbc：common 206Pb. Fig. A1. Stratigraphic columns of core sediments used in this study. Fig. A2. Diatom assemblages. Relative abundances of marine–brackish–freshwater species (left) are expressed as percentages of the total number of frustules counted. Relative abundances of freshwater-species ecologies (right) are expressed as percentages of the total number of frustules counted in freshwater species. More than 100 frustules were counted from each sample. Black circles indicate that the counted frustules make up <1% of the total counted frustules. Fig. A3. Photographs of plant macrofossils. (a) Ruppia rostellata fruit, (b) Najas marina seed, (c) Potamogeton distinctus fruit, (d) Trapa fruit (spine). Scale bar, 1 mm. Table A1. Locations and penetration depths of sediment cores used in this study. Table A2. Sea-level index points from Toyama Bay (Fujii,1992). Measured 14C ages were converted into conventional 14C ages using δ13C values of –27.5‰ and 0‰ for plant and shell, respectively. Magma-discharge rate and geochemical evolution during the pumice-eruption stage of Akagi Volcano, NE Japan. Appendix 1. List of outcrops. Appendix 2. Major element contents of volcanic glass shards. obtaimed by EDX measurements. Appendix 3. Whole rock chemical compositions of pumices. Major and trace-elements were measured by ICP optical and mass spectrometry. Appendix 4-1. Thickness contours for the volcanic cone of younger Akagi Volcano. Appendix 4-2. Thickness contours for the Itoi and Fudo Pumice Flow Deposits. Appendix 4-3. Thickness contours for the Tanashita Pumice Flow Deposit. Appendix 4-4. Thickness contours for the Fujiki Pumice Flow Deposit. Appendix 4-5. Thickness contours for the Wakubara Pumice Flow Deposit. Appendix 4-6. Thickness contours for the Ogo Pumice Flow Deposit. Appendix 4-7. Thickness contours for the Toshimaru Pumice Flow Deposit. Appendix 4-8. Thickness contours for the Nagumo Pumice Flow Deposit. Sakurajima-Bunmei tephra in the Miyazaki Plain. Table S1. Chemical compositions of volcanic glass shards, determined by LA–ICP–MS. Appendix 1. TPhotographs of each core (Br. A to Br. D). Yellow and red dashed outlines indicate Unit 2 and Unit 4, respectively. Unit 4 occurs in Br. A, Br. B and Br. C, but not in Br. D. Small numerals show depth in meters. Appendix 2. Photographs and unit sub-divisions in the depth range –9.4 to –10.4 m of Br. D. Small numerals show elevation in meters. Appendix A. Tuff marker beds originally identified by the author. 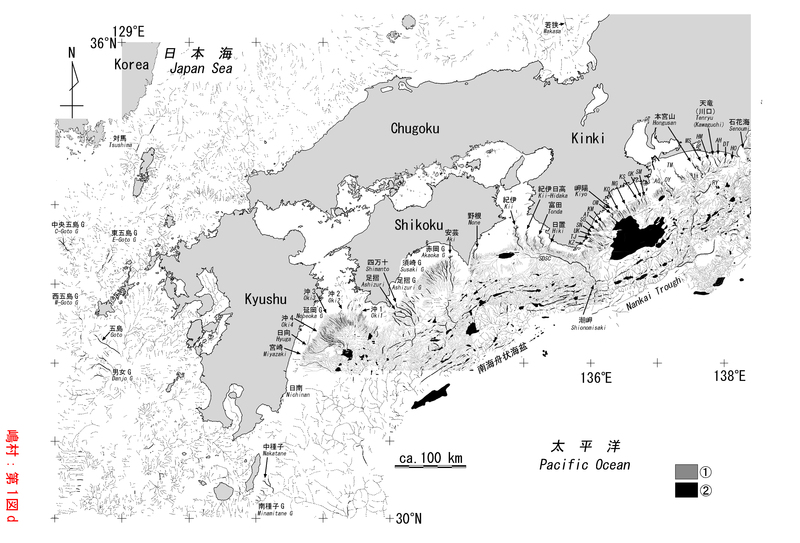 Appendix B. Fault-slip data for the Amatsu, Kiyosumi, and Anno formations in the study area. F, ‘full’ fault-slip data which consist of orientations of the fault planes, lineations,and senses of movements; L, ‘line-only’ fault-slip data which lack senses of movements; S, ‘sense-only’ fault-slip data which lack orientations of lineations; N, normal shear sense; R, reverse shear sense; D, dextral shear sense; S,sinistral shear sense; U, unknown shear sense. Appendix C. Route map in the study area, showing the locations where fault-slip data were obtained. Open file 1 Selected pollen diagrams for the #5, #6, #10, #41, and JMA wells. See Fig. 3 for well locations. Open file 2 Number and percentage of fossil pollen grains in unit 6 of the JMA-V29 borehole. Open file 3 Fossil diatoms in unit 6 of the JMA-V29 borehole. Open file 4 Whole-rock major element (wt%) and trace element (ppm) compositions of volcanic clasts in JMA-V29 borehole samples, as determined by XRF. Open file 5 Whole-rock major element (wt%) and trace element (ppm) compositions of volcanic clasts and lavas samples from boreholes near borehole JMA-V29, as determined by XRF. Open file 1. Petrography of analyzed samples. Open file 2. Photomicrographs of the‘ Wariyama Sheared Granodiorite.’ A: Medium-grained tonalite (KAKUDA7, PPL); B: medium-grained tonalite (KAKUDA7, CPL); C: medium-grained tonalite (KAKUDA9, PPL); D: medium-grained tonalite (KAKUDA9, CPL); E: coarse-grained quartz diorite (11111322, PPL); F: coarse-grained quartz diorite (11111322, CPL); G: coarse-grained tonalite (11111205, PPL); H: coarsegrained tonalite (11111205, CPL). Abbreviations, Hbl: hornblende; Bt: biotite; Pl: plagioclase; Kfs: K-feldspar; Qtz: quartz; Ttn: titanite; PPL: plain polarized light; CPL: crossed polarized light. Open file 3. Sampling locality. Appendix 1. Whole-rock chemical compositions of representative samples from the Oshima-Kojima volcano. Unit names are as in Table 1. Sample localities are shown in Fig. 3. Appendix 2. 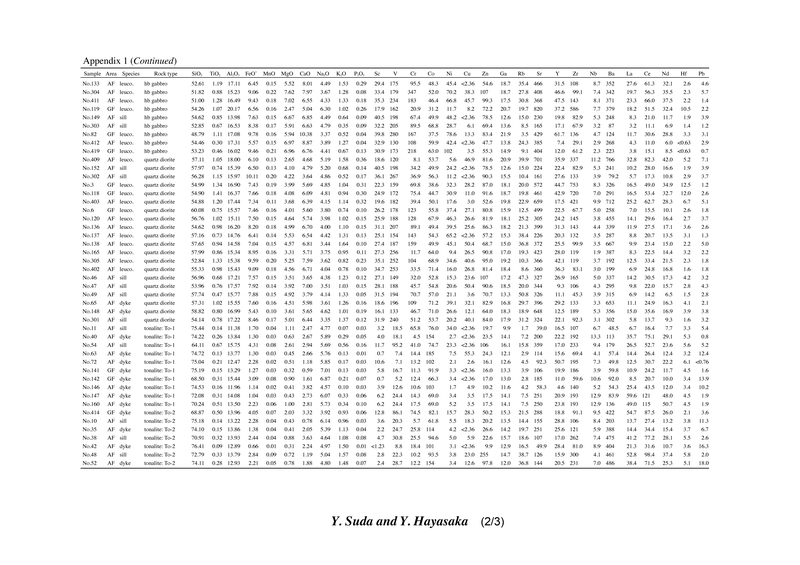 Sr and Nd isotopic compositions of wholerock samples from the Kariba-yama, Oshima-Oshima, and Megata volcanoes. ◯Appendix 1. Equations of the modified Straub method for mesuring the standard deviation of the sedimentation rate within a given measurement time window for the discretized terrestrial outcrop data (Uramoto and Seike, 2012). Table 3. Representative chemical composition of detrital garnet. ◯Appendix 1. Locations of the studied outcrops. ◯Appendix 2. Average major element chemistry of glass shards in tephra layers from the Kioroshi Formation of the Upper Pleistocene Shimosa Group in the Hitachi Terraces. (a) Br-Sc, Bk-Sc, ArP, Nk-Yt, TAu-3, Ob, TAu-9, OiP, KtP, Tephra 20 (1), and Nm-SB. Refer to Fig. 1 for locations of the tephra samples. n: number of analyses. Standard deviations are shown below the average values. *1: Ooi and Yokoyama (2011), *2 measured by SEM with a wide beam to cover a larger analytical area. ◯Appendix 1. Petrography of the Takinosawa and Takakurasan lava series. – = not found, E = euhedral, S = subhedral, A = anhedral, IG = intergranular, IS = intersertal. ◯Appendix 2. Sample location map showing sample numbers and localities based on Fig. 5. ◯Appendix 1. List of samples from the Izumi Mountains, Kinki district, and the Asan Mountains, Shikoku Island. * = Distance from the northern marginal unconformity of the Izumi sedimentary basin; ** = Basin width distance; *** = Distance from Matsuyama (132°42’00” E). ◯Appendix 2. Sample localities of Suzuki (1996) and values of mean random vitrinite reflectance (Rm) converted from maximum vitrinite reflectance (Rmax) values of Suzuki (1996). * = Rm value; ** = Estimates based on Koch and Gunther (1995), using Rm = 0.7469Rmax + 0.2241; *** = Distance from the northern end of the northern marginal facies; **** = Basin width distance; ***** = Distance from Matsuyama (132°42’00” E). ◯Appendix 3. Random vitrinite reflectance (Rr) histograms for 43 samples from the Izumi Group. Class width of each population is 0.05% reflectance; triangles indicate the mean values (Rm) for each sample. ◯Appendix 4. Mean random vitrinite reflectance (Rm) and Rock-Eval Tmax values for the Izumi Group of the Izumi Mountains and the Asan Mountains. Maximum paleotemperatures (Tpeak) were estimated using (A) Tpeak = 104 ln (Rm) + 148 (Barker , 1988), and (B) Tpeak = (ln(Rm) + 1.68)/0.0124 (Barker and Pawlewicz, 1994). Std = standard deviation; “n.d.” denotes not measured. ◯Table 1. Mineral K–Ar ages of analyzed samples from the Miocene in the southern Izumo Basin with the sample number, rock type, formation, occurrence and location (longitude and latitude) of analyzed samples. ◯Table 2. Whole rock K-Ar ages of analyzed samples from the Miocene in the southern Izumo Basin with the sample number, rock type, formation, occurrence and location (longitude and latitude) of analyzed samples. ◯Table 3.Paleomagnetic directions of the Miocene and the Yoshida Plutonic Complex in the Izumo Basin. ◯Table 4. Whole rock K–Ar ages of the Miocene in Ohda and Yasugi cities, Shimane Prefecture(Sawada and Itaya, unpublished data) with the sample number, rock type, formation, occurrence and location (longitude and latitude) of analyzed samples. ◯Appendix 1. Scores of each index for all particles obtained during this study. ◯Appendix 2. 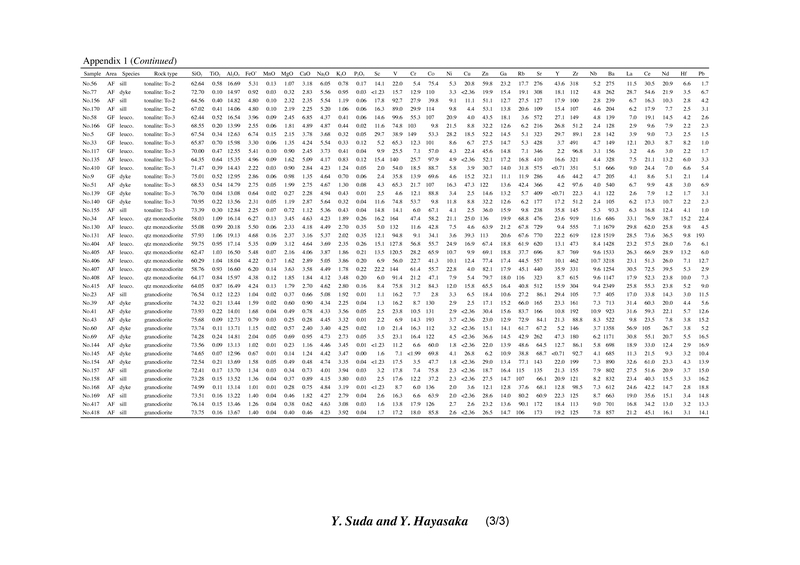 Output files giving the results of principal component analysis; the PCR file enables the calculation of EF1, EF2, and EF3 scores for any given grain, and the PDF file contains Appendix 2a–e. ◯Open File 1. Outline of the preparation techniques used informing a solid geomorphological model covered with mapprinted OK film. ◯Open File 2. View of the laboratory used for classes, focusing on covering a solid geomorphological model with mapprinted OK film, (1) outlining of the procedures involved in OK film covering and examples of potential applications, (2) removal of extraneous OK film with scissors, (3) application of special adhesive onto the cast surface using the index finger, and (4) drying the OK film-covered casts using hairdryers. ◯Open File 3. Timetable for a laboratory class focusing on forming a solid geomorphological model covered with mapprinted OK film, and observation of the model produced during the class in Earth Science Experiment B. ◯Appendix 1. LA-ICP-MS isotopic data for standard zircons (Plešovice, SL13, AS3, QGNG). ◯Table A1. Representative amphibole analyses showing compositional zoning in porphyroclast cores and rims and in matrix amphiboles within upper schistose amphibolite in the Chiroro River area. ◯Table A2. Representative analyses of amphibole from greenschist, upper schistose amphibolite, and later dolerite dykes in the Chiroro River area. ◯Table A3. Representative analyses of plagioclase from greenschist, upper schistose amphibolite, and later dolerite dykes in the Chiroro River area. ◯Table B. Reasons given by participants for their choice of the most impressive stop during the excursion. ◯Table C. Improvements to the excursion suggested by participants. ◯Table D. How to use a peel specimen of sediments in a school lesson, as suggested by participants. ◯Table E. How to conduct a simplified flume experiment in a school lesson, as suggested by participants. ◯Table F. Other impressions of the entire excursion from participants. ◯Table G. References on the implementation of earth science education in schools using regional materials. ◯Table 1. Description of strata exposed on the Miaki trench walls. ◯Table 2. Radiocarbon ages for samples from the Miaki trench site. ◯Table 3. Description of strata exposed on the Ichiba trench walls. ◯Table 4. Radiocarbon ages for samples from the Ichiba trench site. ◯Fig. A1. Representative time-resolved isotopic ratio profiles determined by ablation of zircons from Temora (a) and an unknown sample (060101A) (b). In the case of these analyses, isotopic ratios are consistent between 48 to 120 s for the Temora sample and 53 and 120 s for sample 060101A. These portions of data were integrated and then calibrated during age determination. ◯Table A1. Short- and long-term precision of U–Pb isotope ratios and calculated ages of the FC-1 zircon standard. ◯Table A2. U–Pb isotope ratios and calculated ages from analysis of zircons from Temora and the Itoshima granodiorites calibrated against the FC-1 zircon standard. ◯Table A3. Comparison of U–Pb isotope ratios and calculated age data from analysis of the FC-1 zircon with different laser beam diameters. ◯Table A4. Chemical compositions and U–Th–Pb ages of reference monazites. ◯Appendix 1. (PDF) Synthetic circular data (100 random deviates in each case) drawn from circular distributions. ◯Appendix 2. (PDF) Applications of circular statistics software. Hourly data of the groundwater temperature, water level and the precipitation during 2008 and 2009 at the Atago (AT, Fig. Aa), Yamoto (YM, Fig. Ab) and Minamikata (MN, Fig. Ac) observation sites. BAYTAP-G was applied to the hourly data of water level from all observation sites using the barometric pressure as an associate data. The smooth component output from BAYTAP-G is approximated by the linear equations for the data from the AT and YM observation sites, while approximated by a 3rd-order polynomial equation for the data from the MN observation site. The values of water level shown in the figures represent the residuals of the smooth component from these regression equations. Since the raw data of groundwater temperature from all observation sites contains only very small components of the tidal and barometric effects, BAYTAP-G was not applied. The raw data from the AT and YM observation sites and those before April 16, 2009 from the MN observation site were approximated by a 2nd-order polynomial equation, a linear equation and a 4th-order polynomial equation, respectively. The water temperature data after June 12, 2009 from the MN observation site contain the significant daily fluctuations of unknown causes. After they were removed by the Fourier inverse transform, they were approximated by a 2nd-order polynomial equation. The residuals from these regression equations were plotted in the figures. The data of precipitation obtained from the nearby observatories of Japan Meteorological Agency show the time-series clusters. The cumulative precipitations for every cluster are plotted in the figure. Numerals 1, 2, 3 and 4 in circles denote the times of the off-Ibaraki Prefecture earthquake (MJ7.0) on May 8, 2008, Iwate-Miyagi inland earthquake (MJ7.2) on June 14, 2008, off-Fukushima Prefecture earthquake (MJ6.9) on July 19, 2008, and the northern Iwate prefecture coast earthquake on July 24, 2008 (MJ6.8). Note that the observed water level at the MN observation site after the Iwate-Miyagi inland earthquake is 400 mm lower than those shown in Fig. Ac. Sampling sites and stratigraphic levels are shown in Figs. 1, 2 and 7. Abbreviations: WP, white pumice; GP, gray pumice; BS, black scoria; GS, gray scoria; Pl, plagioclase; Amp, amphibole; Opx, orthopyroxene; Qtz, quartz; Opq, opaque minerals; Xe, xenolith; Ph, phenocryst. ◯Appendix 2. (PDF) Representative whole-rock compositions. Total Fe expressed as Fe2O3. For plotting on the Harker diagrams (Fig. 7), the FeO* is assumed to be FeO + 0.8998 Fe2O3. Sampling sites and stratigraphic levels are shown in Figs. 1, 2, 3 and 6. Abbreviations: WP, white pumice; GP, gray pumice; BS, black scoria; GS, gray scoria. ◯Appendix 3. (PDF) Representative silicate mineral compositions (core compositions). Abbreviations: WP, white pumice; GP, gray pumice; BS, black scoria; GS, gray scoria. * An = 100 × Ca/(Ca + Na + K) in cation units. ** Mg# = 100 × Mg/(Mg + Fet) in cation units, where Fet is total Fe, as Fe2+. ◯Appendix 4. (PDF) Composition of coexisting Fe-Ti oxides Abbreviations: WP, white pumice; GP, gray pumice; BS, black scoria; GS, gray scoria; Mag, magnetite; Ilm, ilmenite; XUlv, mole fraction of ulvöspinel; XIlm, mole fraction of ilmenite. * Calculated using the method of Stormer (1983). ** Calculated using the QUILF 6.42 software package (Anderson et al., 1993) applying technique of Manley and Bacon (2000). The pressure dependence of the geothermometer is slight, and a pressure of 200 MPa was assumed in all calculations. ◯Fig. 1. Photomicrograph of reddish and colorless zircons from the Kbi tephra. ◯Appendix 2. (PDF)Superfamily, family, locality, Taxon Codes, and references of the examined ostracode taxa. ◯Fig. 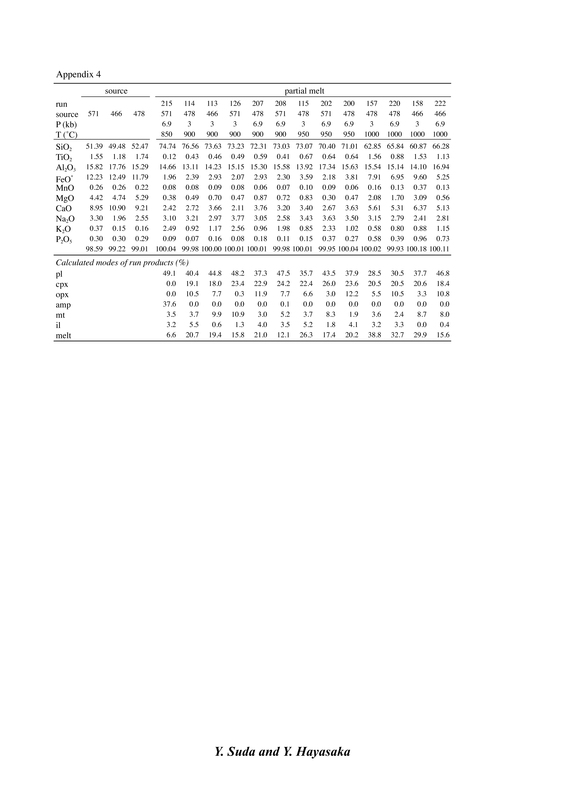 A1.Analytical results of the sample MR1-Fl(Ap). ◯Fig. A2.Analytical results of the sample MR70(Ap). ◯Fig. A3. Analytical results of the sample SKB2(Ap). ◯Fig. A4. Analytical results of the sample SKB2(Ap)_2. ◯Fig. A5. Analytical results of the sample SKB2(Ap)_3. ◯Fig. A6. Analytical results of the sample KSSP(Ap). ◯Fig. A7. Analytical results of the sample AS01(Ap). ◯Fig. A8. Analytical results of the sample TG02(Ap). ◯Fig. A9. Analytical results of the sample KAR-N3(Ap). ◯Fig. A10. Analytical results of the sample KAR4e(Ap). ◯Fig. A11. Analytical results of the sample KAR5(Ap). ◯Appendix 1　Major oxides (in wt. %) and trace elemental abundances (in ppm) for the Yakuno rocks in the Asago body. Total Fe as FeO. Abbreviations: hb mtgb, hornblende metagabbro; amph., amphibolite; qtz monzodiorite, quartz monzodiorite; leuco., leucosome. ◯Appendix 2　Mineral–melt partition coefficients. Data sources: Ar Arth (1976); BD Bacon and Druitt (1988); Bi Binderman et al. (1998); Bo Bougault and Hekinian (1974); Do Dostal et al. (1983); DS Dunn and Sen (1994); EG Ewart and Griffin (1994); Fj Fujimaki (1986); Fu Fujimaki et al. (1984); Gi Gill (1981); Gr Green et al. (2000); GP Green and Pearson (1987); I interpolated or extrapolated; Ha Hauri et al. (1994); JN Jang and Naslund (2003); MH Mahood and Hildreth (1983); Ma Martin (1987); MC McCallum and Charette (1978); NS Nagasawa and Schnetzler (1971); NC Nash and Crecraft (1985); Ni Nielsen et al. (1992); PN Pearce and Norry (1979); PS Philpotts and Schnetzler (1970); Ro Rollinson (1993); Si Sisson (1994); SH Stimac and Hickmott (1994); ZB Zack and Brumm (1998) Mineral abbreviations: pl, plagioclase; hbl, hornblende; cpx, clinopyroxene; opx, orthopyroxene; mt, magnetite; ilm, ilmenite; ol, olivine; spl, spinel; ap, apatite; zir, zircon; bt, biotite. where Cliq is weight concentration in the residual liquid, Ccum is weight concentration in the cumulate F is fraction of residual liquid, C0 is weight concentration in the parental liquid and Di is bulk partition coefficient of crystallizing assemblage for the element. Partition coefficients for basalte and basaltic andesite liquid (Appendix 2) were applied for the modeling of first-stage Yakuno rocks (Figs. 10 and 11), and those for the dacite and rhyolite liquids were applied for the modeling of second-stage Yakuno rocks (Figs. 15 and 17). where CMelt is weight concentration in the partial melt, F is fraction of partial melt produced, Ci is weight concentration in the original unmelted solid (i.e. source) and DRS is bulk partition coefficient of the element in the original solid. Partition coefficients for andesite liquid (Appendix 2) were applied for the modeling of partial melting of first-stage Yakuno rocks (Fig. 16). ◯Appendix 4　Compositions of source (starting material) and partial melts (in wt. %), and modes of run products (in %) for the dehydration melting experiment by Beard and Lofgren (1991). ◯Appendix 1. Correlation of sample numbers with depth in core and sediment type. Pollen extraction procedures (A and B) are explained in the text. ◯Appendix 2. Composition of pollen and spores included in each sample. Each pollen frequency (%) is based on total sum of pollen of trees and shrubs. Fe2O3*; total Fe as Fe2O3. FeO**; total Fe as FeO. LOI; loss on ignition. XMg=Mg/(Mg+Fe). n.d.; not determined. n.a. ; not analyzed. CHMB: central area of the Hidaka metamorphic Belt, nSHMB: Northern part of southern area of the Hidaka metamorphic Belt, sSHMB: southern part of southern area of the Hidaka metamorphic Belt, Sk: Shimokawa area, Tm: Tomuraushi area, Np: Nipesotsu area, Ot: Okutokachi area, Oc: Ochiai area. SH: Shunbetsu river, KB: Koibokushushibichari river, NNC: Nanashino-sawa river, OG: Ogawara-zawa river, BK: Benikaru-zawa river, SS: Sasshibichari river, NO: Nishuomanai-zawa river, SM: Soematsu-zawa river, HB: Hidakahorobetsu river, SG: Sogabetsu river, MM: Menashuman river, NOB: Niobetsu river, SC: Shirochinomi river, MS: Menashunbetsu river, MK: Mukorobetsu river, PN: Panke river, SN: Shinnosukeshunbetsu river, MKT: Mikitonai river, MKI: Mikiinai river, MN: Menashiesanbetsu river, ON: Onarushibe river, FC: Fuchimi river, RB: Rubeshibe river, NK: Nikanbetsu river, ST: Shiitokachi river, NU: Nupun-Tomuraushi river, NP: Nipesotsu river, OA: Ochiaino-sawa river, SI: Shiisopurachi river, UC: Uchino-sawa river, KN: Kanano-sawa river, TM: Tomamu river. Abbreviations are same to those in Appendix 1. Microtexture of chromitite (BOM-03a) and serpentinite (BOM-03b). (A) Photomicrograph of the occurrence of zoned Cr-spinel in chromitite [Plane polarized light = PPL]. (B) Photomicrograph of enlarged view of the inclusion-rich in zoned Cr-spinel in chromitite [PPL]. (C) X-ray image of Fe (Kα) of Cr-spinel grain of (B). (D) X-ray image of Mg (Kα) of (C). (E) X-ray image of Ti (Kα) of (C). (F) X-ray image of Na (Kα) of (C), showing distribution of pargasitic amphibole inclusions. (G) Photomicrograph of the occurrence of zoned Cr-spinel in serpentinite [PPL]. (H) Back-scattered electron image of the zoned Cr-spinel in serpentinite. Scale bars on each image represent 1 mm. Abbreviations: CrSp = Cr-spinel, Atg = antigorite, Mgs = magnesite. 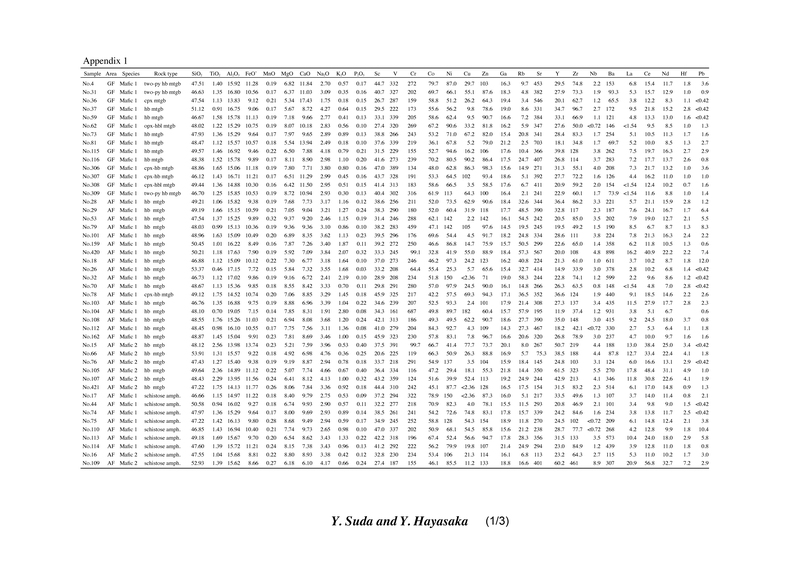 Lists of the sampled dates and intervals, fluxes of total Radiolaria and their three subgroups (Nassellaria, Spumellaria, Phaeodaria), and diversity indices. Radiolarian species counts (No. shells per microslide) at Shallow and Deep sediment trap depths at Sites MT1, MT2, MT3, and MT5. Radiolarian species fluxes (No. shells m-2 d-1) at Shallow and Deep sediment traps deployed at Sites MT1, MT2, MT3, and MT5 during January-December 1999 in the western and central equatorial Pacific. Radiolarian species count data obtained from core tops (0-0.5 cm) of the multiple cores recovered at four sediment trap sites. ○Appendix 2. Calculated ages of each sample. The dotted lines indicate the marked depth and year, which are referred to the construction activities. ○Appendix 3. Communality and factor loadings.